The Whitman Baltimore Expo, one of the industry's major events of the year, begins this week and will include the Stack's Bowers Official Baltimore Auction. This sale features six major collections with various specialties. Among the most sought after coins will be the 1880 Shield Nickel graded MS65 by PCGS. This is an extremely rare date with only 10 coins certified by NGC and PCGS total with only one higher in PCGS MS66. Another rarity sure to attract aggressive bidding will be the 1879 $4 Gold Stella; this is the Flowing Hair example certified by PCGS as PR64 Cameo. The current Market for this coin is listed at $155,000. 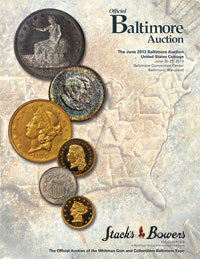 Check out the Stack's Bowers website for more auction information. Gold has remained under the $1,400 mark for the last couple of weeks, and the previous high premiums for U.S. Gold coins have begun to drift lower. Demand has dropped off during this period, however, despite the lower Market prices for generic $5 Indians, there is a long list of advances for many of the better dates in AU55 through MS64. The following dates and grades list higher Market prices this past week. 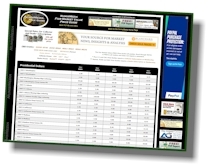 In this week’s HD Wholesale Market Dealer Price Guide, Half Dollars are showing additional strength. 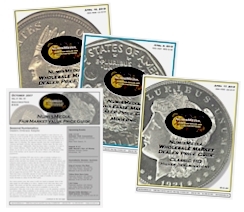 The Bust and Walking Liberty Half Dollar charts are showing numerous advances in most grades. Although buyers are very selective in the Bust Half series, we are finding a lot of activity for coins that have solid eye appeal. The 1809 III Edge in AU55 is higher at $1,775 Market this week; the 1810 in MS63 jumped to $3,200 and in MS65 $12,650. The 1821 in MS64, with a population of only 39 coins (NGC and PCGS combined), advanced to $4,525. Walkers are steady to higher especially for the early dates. MS64 to MS66 from 1916 through 1933 are in demand and trade very quickly at today’s Market levels. If they have the CAC sticker or + designation, buyers are more aggressive. The 1916 S in MS64 is up to $2,700 and the 1929 S in MS66 is higher at $4,425.